It was all a bit Calendar Girls. There we were, three women on the more experienced side of 40, having just taken up a range of increasingly silly poses for the photographer from the local newspaper. 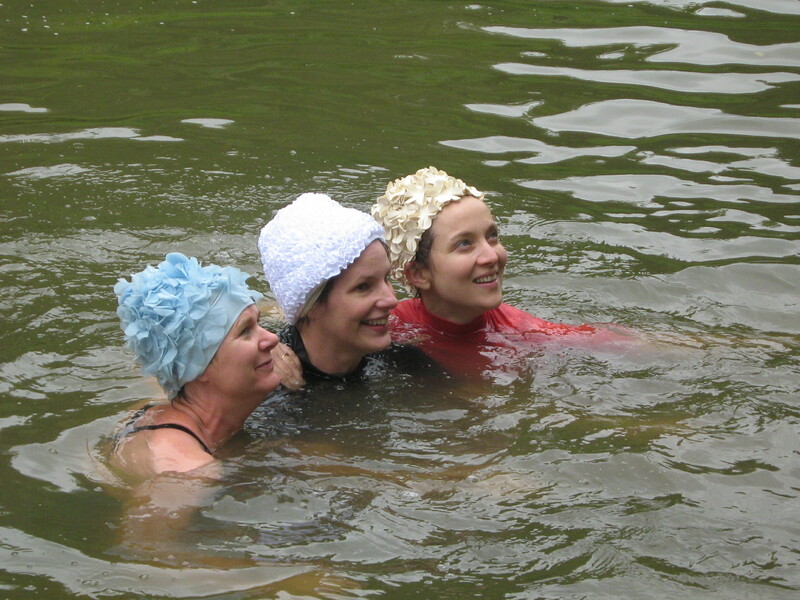 We were sporting a selection of vintage swimhats that were beyond absurd: heaven only knows where my friend had got them from, or why she should have a collection of such things. All this was in a good cause: we’d planned our mile-long river swim to raise funds for the national charity for children and young people with autism, Ambitious about Autism. And it was a cause close to my heart, as my six-year-old son has autism. About to swim a mile in the dirty river Thames on Sunday with @AlisonLMercer. Hoping it will be comedy gold on many counts. We’d shed our charity t-shirts. Standing on the little jetty in our swimming costumes, we were fast approaching the moment of no return. Our eyes met. I don’t know who said, ‘Oh come on, let’s get in and get it over with,’ but somebody did. And then we were in. We posed for a few more photos, and then we were off. I’d taken my swimhat off by this point. Too tight! I’d originally been absolutely adamant that I was NOT GOING TO TALK. When I’m in my local swimming pool I get a little frustrated with those ladies who swim along double file, talking all the way. Swim! Chat later! I find myself thinking. And anyway, talking might have increased the chance that some of that Thames water – supposedly better than it used to be, but still, not exactly pure – could end up in my mouth, and then ultimately in my stomach, with potentially unpleasant results. Did I stick to that? Did I heck. After the first few strokes, I heard my friends, the two Helens, chatting away behind me, and of course I joined in. We chatted solidly the whole way. Apparently the acoustics were such that our riverbank supporters could hear every single word loud and clear, even when their view of us was obscured by foliage. Just a note of caution – swimming in open water is potentially dangerous, and I’m not going to advocate it. As we all know water is always to be treated with great respect and wariness. I was nearly bowled out into the sea at Cornwall as a small child, and that is one of my formative memories – in fact, what I remember best of all is not being in the water, but having to wear a very odd assembly of everybody else’s too-big clothes on the way home, and no knickers. 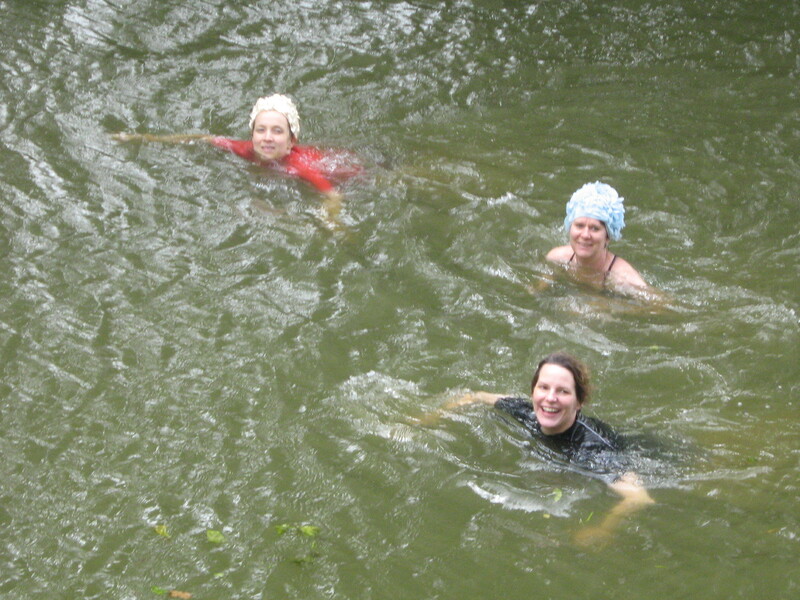 One of my friends is an experienced river swimmer: she’d come up with the idea for our Thames dip and researched it. My river companions started thinking about our next challenge almost as soon as we’d finished this one! I’ve noticed that a theme that crops up from time to time in my fiction is the friendship that takes a cautious character out of the familiar and into adventure – that’s what happens to Anna in After I Left You (due out Jan 2014) when she goes to university. In art as in life! Helen Rumbelow, me, Helen Sage. Check us out! Yeah! The real challenge that day, however, was the one accomplished by my husband, Ian Pindar, who looked after our children on the river bank. We’d hesitated about whether to bring our son. It was an absolutely exceptional situation – would it confuse him? Would he run off? And yet we had talked to him about it and it was clear he wanted to be there. And so he was. And I will always treasure the memory of seeing my husband and both my children all there together, smiling and waving at me as I looked up at them from the river.